A little over a year and a half ago, I appeared on stage at a book fair to read to a group of children. After sharing “The Monster That Ate My Socks”, which they loved, I was told that I still had time to do another reading, so I pulled out “I Don’t Want to Go to School”. The kids always enjoy that book, not only because it’s a universally kid-friendly topic, but because they get to participate in reading it. I always ask them to help me read the title line and, each time they do so, they get louder and louder until everyone is screaming by the end of the reading. It’s super fun, but it also makes me think about one of the worst aspects of reading to children: the feeling of it being one-sided. When I read sock monster it’s to the child. They are to be quiet and, hopefully, entertained. “School” is a bit more interactive as they have been assigned a part, but I could just as easily ask them to be quiet and do the whole things myself. What about a book, though, where the kids are required to interact? That idea led to “The Giggle Game” which is, just as the name implies, a game. The goal is to make all of the animal sounds in the book without laughing. The more children that participate, the harder it is not to laugh, so the book is wonderful in groups. From my experience in reading it, the adults are always the ones who laugh first, meaning that we always “lose” the game, but the kids don’t realize that seeing them have fun is a win to us! Beyond a game, the book is also an opportunity to release energy. I call it a “wind-me-down” book, as in you read it to get all that stored up energy out before settling down for something like bedtime. The animal sounds go from loudest, a lion, to quietest, a mouse, and, depending on how you use the final pages, the “let it all out” spread, you could also use the book as a warm-up. With such a simple concept, I knew the book needed something special for the artwork. So instead of digital drawing or pencil sketches, I went with paper craft. All of the illustrations in the book were made using construction paper, a Xacto knife, and a glue stick. It was time-consuming, thus the year to make it, and I even had to redo half of the images, but the end result has a fantastic texture and I couldn’t be more proud of how it looks. I absolutely adore this book and put my heart and soul into it and you can tell when you see it for yourself. So without further ado, I’m pleased to announce that “The Giggle Game” is now available in Kindle eBook and Hardcover print. The book was designed for print since it’s great for groups, so get that version if you can. I even priced it lower than my other hardcovers just to get it into kid’s hands. The Kindle version is a carbon copy of the book but is best for small families. One more thing, from now until the end of the month, I’m donating $2 for every review posted on Amazon for the book to OAR (Organization for Autism Research.) While the book is meant for everyone, many of you know that Autism is near to my heart and I thought this would be a great way to celebrate the new release, encourage people to leave a review, and help out a good cause. So what do you think? Ready to make your children laugh? Author adminPosted on September 28, 2017 Categories commentaryTags auhtor interviews, childrens books, commentary, self-publishing, writingLeave a comment on What’s Life Like in the Messy Middle? In the beginning, many years ago, ten-year-old Alice Cotton had her head under the piano lid of her father’s baby grand piano. She was plucking the strings and listening to all the resonating sounds it made. For hours! Then, later, as a teen, after playing clarinet in a school marching band, she started performing and writing songs with her new guitar. Unbeknownst to her, she was also in the process of meeting her future music partners who would be accompanying her in creating successful music acts around the U.S. It started in New Orleans, where Alice Cotton and her childhood friend, Cora McCann (Writer & Editor, Content Marketing, Cleveland Clinic), wrote songs and performed them as a duo acoustic guitar act called Sunstorm. They performed on Bourbon Street at one of the top New Orlean’s tourist nightclubs. They continued working in taverns and clubs around the city, making a name for themselves until Alice decided to move to Oregon. Cora eventually moved back to Ohio. In Oregon, Alice co-led one of the top performing night club bands that she shared with another childhood friend, Lisa Coffey, (harpist/instructor). Of course, their music was very original with the sound of harp strings next to the guitar, bass, and drums. They worked hard to become one of the top working bands in the area. This is when Alice learned to play electric guitar as a rhythm and lead player. Later, Alice joined the Byll Davis band that played on the weekends for dances and private clubs as one of the only female lead guitarists in Oregon. The rest of the time she taught 4th and 5th grade in public school and math and art to homeschoolers, always encouraging her students to pursue music and performance in fun ways. Parents, teachers and children can read along and discover Freya’s journey to triumph as she conquers her fear with a little help from a few unusual desert friends. The story provides an excellent opportunity to begin talking to your little ones about facing their fears, trying new experiences and stepping outside of their comfort zone. The fantastic David (Maurice) Chuka created this post on the importance of your cover. Believe it or not, readers really do judge a book by its cover! Writing is fun. Putting together a children’s picture book and getting it published is always an exhilarating experience. However, that is the fun side of writing. The not so fun side is actually marketing your book and getting as many people to know about it and hopefully buy it. This is the part of writing or publishing a book that leaves most writers frustrated. The reality is that just because a book is published does not mean it can never be revisited. I always read and re-read books I’ve written to see if there’s something I need to edit that can improve a reader’s experience as well as boost sales. With this in mind, one of my books has been given me cause for concern. An author’s books are like his babies and he/she wants them all to do well. All my children’s books so far have been favorably received by the market and have all achieved best seller status in one or multiple categories in the Amazon store. However, What Do You Call a Baby Lion? hasn’t done so well. I’ve really been thinking of what I could do to make it more popular. The Title – I believe (and please feel free to disagree) that the title doesn’t lend itself to a wide audience. Anyone who isn’t interested in lions will overlook this book. Also the title doesn’t fully represent what the book is really about – BABY ANIMALS. 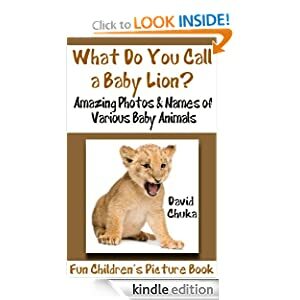 The concept behind this book was to introduce little children to the names of baby animals. The book starts with a little boy whose mom has just had a baby girl and he wonders what baby animals are called. The Cover – You know the popular saying ‘Don’t judge a book by it’s cover’ Well, with regard to a human being, I totally agree. You might be making a big mistake judging as hopeless the scruffy, shy looking guy in front of you at the check out till who might actually be the CEO of a Fortune 500 company. However, when it comes to books, your cover is everything. Or at least is the first frontier upon which the battle is either won or lost. Of all the books I have published, I never had that YES feeling (with What Do You Call a Baby Lion?) when I got it back from my book cover designer. Too much white space, I really wasn’t feeling the brown font, the square around the lion seemed forced etc. So for the past month, it’s been rumbling in my mind what to do with ‘What Do You Call a Baby Lion?’ And over the weekend I came up with the solution. Also, based upon the feedback I have received, the cutest animal in the book was the baby hedgehog. This will now be the main character on the book cover. There will be yellow text on a green background for the cover. This has worked really well on my other books and I’m hopeful it’ll be the same on this book. My designer is currently working on the book cover and once that has been completed, I will relaunch the book and have a free download day. If you’re an aspiring author and wondering why your book isn’t selling so well, there’s always something extra you can do. I’m hopeful the tweaks I have done will have a positive effect on the sales of this book. Will report back sometime next week to let you know how it went. Also watch out for the announcement on the free download day. I would really love your comments with regard to this post. Eagle eyed readers may notice that my site recently underwent a major transformation. That’s no accident. On the contrary, it was forced. My web host service (IXWebhosting.com) notified me that my website had been compromised by malware. To be more specific, my WordPress blog had been infected and was busy sending out spam email to heaven knows where. The spike in traffic raised a flag, IX shut down my site, and I lost everything. The malware had been installed through brute force password cracking (a computer kept trying to log in until it guessed right, literally millions of times.) Once inside, it created an account for itself, gave it full permissions, and started executing PHP scripts while modifying the other PHP files that were there already. PHP files are what makes WordPress function. They are basically programs that can be run server side. Once the malware virus started changing these though, it made it almost impossible to recover from. IX cleaned the server and removed the bad files, but the damage was done. The malware had changed critical WordPress PHP files and I couldn’t get them back without reinstalling everything. If all of that sounded confusing or full of jargon, don’t worry, I only understand it because I had to. You don’t have to understand PHP though to protect yourself. Here’s three easy steps you can take right now to keep this curse from happening to you. Install a firewall program on your WordPress blog. Under plugins search for Firewall and find one that both stops robots from accessing your page and also limits the number of password attempts. WP Security and WordFence come highly recommended. Your last name combined with your birthday won’t cut it anymore. Even adding extra characters and punctuation won’t help much either. Use the password generator under Users to create a strong password. Those are usually around 16 characters and have random numbers and letters. Copy and paste into a password file if you can’t remember it. I didn’t have any backups so I had to start from scratch, however, WordPress supports backups and restores. Follow this tutorial to learn how to save your work. Preventing an attack is much easier than recovering from one. I’m lucky that it was isolated and that I have such an awesome and supportive community, however, if I had known better earlier it would have saved a ton of stress. These steps only take a few minutes but they can save you weeks of work. As for me, I’m making a tall pitcher of lemonade out of these lemons.